Have you seen or eaten nutritional yeast? It’s that cheesy, nutty, flaky, yellow condiment used mainly by vegans and vegetarians to provide protein, minerals, and B vitamins! How couldn’t it be healthy? A couple of years ago I made a vegan soup for some friends. I added nutritional yeast for a boost of flavor and nutrition, then ate a bowl to double-check the flavors. Within minutes of eating the bowl of soup, I nearly lost both my balance and consciousness. Several months later, I ate nutritional yeast again and the same symptoms overcame me. The correlation was unmistakable. I'd been a vegetarian for 10 years and used to eat this seemingly benign and nutrient-infused ingredient! What changed? Who can eat nutritional yeast safely? And who should avoid it? The production of nutritional yeast begins in highly-controlled laboratories, where a common yeast called Saccharomyces cerevisiae grows on one of three nutrient-deficient foods: sugar cane, beet molasses (usually genetically modified), or wood pulp. Lacking an external source of nutrients, the yeast makes its own. Manufacturers then dry the yeast to preserve its nutrients. They usually spray it with hot gas, a process that causes thermal degradation and loss of nutrients. Nutritional yeast can also be eaten fresh (although this product is no longer available to buy) or dried with a more traditional method called “drum drying”. Only two companies in America (Trim Healthy Mama and Sari) produce both a non-genetically-modified and a non-vitamin-fortified nutritional yeast. Most unsuspecting consumers purchase one of the mainstream brands of genetically-modified, gas-dried, and folic acid-fortified nutritional yeast! Note: Bob’s Red Mill, Bragg, Frontier, Harmony House, NOW Foods and Red Star nutritional yeast brands all pasteurize their products as well as fortifying with synthetic ingredients (source). Glutamic acid, a naturally occurring neurotransmitter found in plant and animal proteins, excites our taste buds and the neurons in our brains. Whole foods like bone broth and aged cheese contain bound, unprocessed, and healthful (for most people) glutamic acid. On the other hand, unnaturally fermented or manufactured foods contain something called “processed free glutamic acid”. In other words, glutamic acid has been freed from its protein during the manufacturing process. It is now an excitotoxin. Excitotoxins interfere with normal brain function by overstimulating neuron receptors in the hypothalamus and causing the death of neurons. This is why nutritional yeast is considered impure — it most likely contains processed free glutamic acid (source). When ingested, the highly concentrated glutamates enter the bloodstream then the brain without going through the proper channels of digestion (source). 25% of the population reacts adversely to free glutamic acid, usually within 48 hours of ingestion. The ingestion of MSG has similar side effects to neurological drugs (source). Excitotoxins also cause long-term, serious neuro-degenerative damage, including Alzheimer’s Disease and Parkinson’s Disease (source). While MSG does not cause noticeable symptoms in everyone, it is a known carcinogen and damages the brain. More controversial is whether or not nutritional yeast contains MSG. My body's reaction to nutritional yeast suggests it does. I don't react negatively to other glutamate-rich foods, like bone broth and aged cheeses (healthful staples in my diet). Jack Samuels, the late foremost authority on MSG in the traditional community, includes “yeast food, yeast nutrient” in his list of “ingredients that always contain processed free glutamic acid”. Logically speaking, when we look at how MSG develops in foods, the production method of nutritional yeast matches. It is a manufactured, fermented food, highly concentrated in flavor and glutamates. This kind of man-made food is exactly where we see MSG occurring, as a byproduct of other food processes (source). Also, interestingly, the manufacture of MSG itself is very similar to the process of creating nutritional yeast (source)! Nutritional yeast is a flavor enhancer! That’s why vegetarians and vegans love it. So is MSG. Any man-made flavor-enhancer should make us cautious. 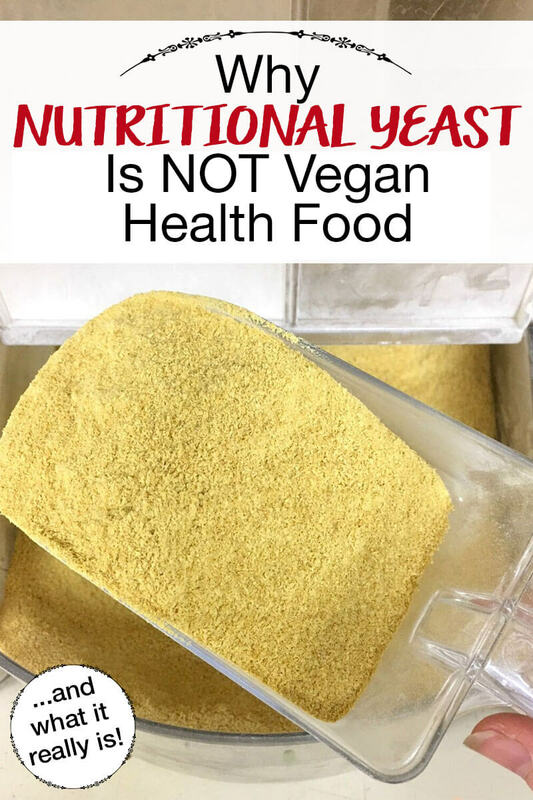 Most nutritional yeast is genetically modified and all likely contains MSG, which causes serious neurological disorders and other physiological health problems. Many consumers are symptom-free, even after years of eating nutritional yeast. However, MSG works slowly and insidiously on the human brain, and it is hard to measure its effects on those who don’t have a glutamate sensitivity. While nutritional yeast contains amino acids, minerals, and B vitamins, there are better food sources for this nutrition that are not man-made. Babies and children are the most sensitive, and any foods that potentially contain MSG should be strictly avoided (source). Until we chemically analyze the amount of processed free glutamic acid in different brands of nutritional yeast, we must base our conclusions on the evidence we have. Shall we not eat truly natural, unadulterated, unprocessed, whole foods? If you still wish to consume even small amounts of nutritional yeast and the MSG does not seem to bother you, Trim Healthy Mama and Sari sell non-genetically-modified, non-fortified nutritional yeast (yes, they probably contain MSG due to the manufacturing process). Avoid other American brands like Red Star nutritional yeast. What have your experiences been with nutritional yeast? Braggs Apple Cider Vinegar, 2 tbl in a glass of water 20 minutes before your meal! Hi there Mark, you will probably benefit by reading the book “Why Stomach Acid is Good for You: Natural Relief from Heartburn, Indigestion, Reflux & GERD” by doctors Jonathan V. Wright and Lane Lenard. While waiting for the book to be delivered you might also want to check out what Dr. John Bergman has to say on YouTube in his short “Digestive Disorders Health Rant” posted up a few years ago, he does a good job on explaining why your acid reflux may only get worse with antacid tablets or prescription meds. Since 30 years of doing the same thing hasn’t worked, perhaps it’s time to take a look at alternative approaches to the problem. That said, as always, do your own research and then decide what YOU want to try! Hope this helps, best of luck on your journey. ACV can aggravate your reflux like it did me! Especially if your stomach produces too much acid. I fantastic difference in mine acid reflux (now almost non-existent) was drinking beef collagen every a.m. before anything. 2 Tbl. mixed in my morning green drink and I am good to eat ANYTHING all day! Hope it works for you! I use 2 Tbl. Collagen protein powder every a.m. before food, in my green drink. Helps coat the stomach. I can eat just about anything if I take this first thing in the a.m. Most people have gerd because of low acid in the stomach…HOWEVER there are a few like me that can’t handle ANY acid and more acid makes it WORSE. If the ACV makes your stomach worse then you are one of those people like me. Try the collagen. Using a bed wedge has helped my reflux. How to treat acid reflux depends on what your specific cause is. It can be too much acid, or too little acid, or inflammation anywhere in the gi tract (which can also be caused by a number of things). I figured mine out with trial and error. I noticed I would always get heartburn when I had to poop, and was bloated and constipated, and every single time, the heartburn would go away after pooping. I started taking different kinds of probiotics, and bang. Solved the problem. No more bloating. No more reflux. That’s just my particular story. “Note: Bob’s Red Mill, Bragg, Frontier, Harmony House, NOW Foods and Red Star brands all pasteurize their products as well as fortifying with synthetic ingredients (source).” is a mistake!!! If you click on the report that this information is gathered from it says, fortified with NATURAL ingredients NOT synthethic for Bragg, Frontier and Harmony House, bad reporting! Hi Victoria, thank you for voicing your concern. Unfortunately “natural” doesn’t mean much anymore in food marketing. The bright yellow color alone in each of these products is the sign of synthetic B vitamins being added. Each of the companies was contacted by the source’s author that you refer to. If you scroll further down the article you mention, beyond the chart, he goes on to explain this: “Unfortunately the term ‘natural’ is not regulated, making it difficult to assess the true quality of the fortifying nutrients without inside access to the manufacturing process. Currently there is only one major brand offering non-fortified nutritional yeast.” This is Sari. I hope this helps to clarify that the reporting is accurate. I am a little confused. Are you saying that Trim Healthy Mana and Sari brands do not have msg so they are fine to eat? Or they are non-gmo and non-fortified but still have msg so avoid them too? Hi Kori, personally I do not consider any brand of nutritional yeast to be ideal. It is likely that they all contain MSG. However, if someone is free of symptoms and would like to keep nutritional yeast in their diet, the two brands I mention above are the safest options. Thank you, Megan. That is the clarification I was looking for. I appreciate you taking the time to respond! The issue of monosodium glutamate, or MSG, in nutritional yeast is a sensitive one. Yeast-based products naturally contain glutamic acid, an amino acid that is found in abundance in plant and animal proteins. … Nutritional yeast does not contain MSG unless it is added. Yet the source says that all but Bob’s Red Mill use natural ingredients and a natural drying process. ??? Hi David, if you scroll further down the article you mention, beyond the chart, he goes on to explain this: “Unfortunately the term ‘natural’ is not regulated, making it difficult to assess the true quality of the fortifying nutrients without inside access to the manufacturing process. Currently there is only one major brand offering non-fortified nutritional yeast.” This is Sari. The author of that article contacted each of the companies. Also, the color of each of the brands you mention is bright yellow, which is a sign of synthetic B vitamins being added. Sari and Trim Healthy Mama’s products are beige in color. The chart at the top of the article is unfortunate, as it is misleading. I have the same question as Kori above about whether nutritional yeast from Trim Healthy Mama and Sari should also be avoided. Hi Tammy, personally I do not consider any brand of nutritional yeast to be ideal. It is likely that they all contain MSG. However, if someone is free of symptoms and would like to keep nutritional yeast in their diet, the two brands I mention above are the safest options. I’m confused about the two no-gmo, non-fortified ones also. Do they potentially contain msg as well? Hi Nichole, yes, they do potentially contain MSG as well. Thanks for your question. I think Nutritional Yeast (NY) is misunderstood, it’s kinda like gluten, some people can eat it and be fine while others have bad problems with it, I have never had any issue with NY and neither has my family. Is there an organic nutritional yeast without added vitamins? I will only eat organic. I believe Foods Alive (a USA company) also produce a non-synthetic, unfortified, Non-GMO Nutritional Yeast. It has one ingredient: Dried yeast. I buy it at Iherb and the taste is pretty good. If anyone knows why this brand’s Nutritional Yeast is not good, please feel free to comment. Thanks! Hi Christine, I think you are right. Their data on the product says non-GM and no synthetic B-Vitamins. What about brewer’s yeast? Same issues or is that a completely different product? Thank you! I’ve been wondering about nutritional yeast for quite some time now. I avoid dairy, and would occasionally like to try some of the alternative recipes for dairy cheeses that are made only from clean, whole food sources but all naturally call for nutritional yeast. It seems you feel comfortable with the Sari brand based off of your research, so I’m considering giving it a try. Their Amazon page states that it doesn’t contain any MSG, do you have any information regarding that? Any updates or lab test results like you mentioned in the article above? Also, I wonder if nutritional yeast from Sari brand could be addictive like it seems other nutritional yeasts seem to be for some people? I notice that when I google the active ingredient stated on some of the brands ingredient lists, even the one listed in the comment before from iHerb, “saccharomyces cerevisiae” it comes up as brewers yeast, which I’ve seen stated as not healthy. Do you feel that a drum-dryed nutritional yeast that also isn’t fortified or GMO would be safe? Bragg’s Nutritional Yeast is both Non-GMO and although is is fortified with nutrients, they are NOT synthetic, they are natural nutrients. Bottom Line: Bragg’s is roller drum dried, non-gmo, and fortified with natural (*not* synthetic) ingredients. Thank you for the other information though! I was just verifying. All I did was click on the link you added that said “Source” and Bragg’s information was right there at the top with the others… maybe it has changed since you wrote this article. Hi Megan – Thank you for taking the time to share this helpful information. You say “there are better food sources for this nutrition that are not man-made.” Can you provide some suggestions for vegans? Thank you! Hi Suzanne, you’re welcome. I’m glad it was helpful. Is your main vegan dietary need B vitamins (or iron)? I do actually believe that long term vegan diets leave most people nutrient deficient and that animals provide nutrition that humans need. I want to be sensitive to your beliefs too. But as far as food-sourced nutrition, the best for proteins and fats do come from animals. There are good B vitamin supplements (like the B complex from Seeking Health or True Balance by NOW, but over time they can cause imbalances, especially if there are any detox pathways that need extra support; so food sourced is best or working with a knowledgeable functional medical practitioner or naturopath who knows about B12, B complexes, niacin (B3) etc. Hello Megan, What animal food sources for B-complex vitamins do you recommend in place of nutritional yeast? Thanks very much. Hi Enid, organ meats are high in B vitamins, especially B12 and folate. As you probably know, you can purchase encapsulated liver if you don’t enjoy the flavor. Your advice saying the best protein and fats are from animals is not true at all. We can get everything we need from fruit, vegetables, nuts and seeds, you just have to eat enough. Also organ meats are very dangerous because you are taking in the toxins that each animal has accumulated. When a vegan asks for advice it is wrong to suggest animal products. Why does nutritional yeast give me gas? I think it’s really cool how you answer these questions and comments directly. Thanks for the informative article! What do you recommend as a source of vitamin B12 for a Vegan? Hi Pay, food sources of B12 don’t assimilate well, so there are two choices when supplementing that assimilate best: One is the sublingual lozenges and the second is B12 shots (which I give myself weekly), best decided upon with a doctor’s guidance. Best wishes. We need very little B12 which we can make in our own stomachs, make sure your B12 supplements are methylcobamin, anything cheaper is cyanocobalim which has cyanide in it. Spirulina, mushrooms, chlorella and only lightly washed fresh produce from your garden all help with getting enough B12. I have been suspicious of nutritional yeast as each time I use it I seem to pass out. Then I have brain fog and unable to be coherent. It’s certainly an excito -toxin for me…there’s a high and then a crash. My family however use it without any negative effects. It’s evident that it doesn’t have a negative effect on everyone. Thanks for sharing Megan. i never had a problem with yeast until i started using one that was overfortified. too many b vitamins built up. they are supposed to be water soluble, but not every person’s body works the same. the build up caused reactions to natural foods containing the same vitamins. i just figured all nooch is similar. big mistake. be on the look out for how highly they are fortified and with which b vitamins. i know it wasn’t the msg because one of the only foods that didn’t give me problems was packaged ramen, which is known for containing msg. I started eating NY recently after decades of not eating it. I love the stuff and was putting it in and on soups and salads. Almost immediately I started having diarrhea-like symptoms but didn’t know why. I stopped the NY and bowels returned to normal. Started eating it again and diarrhea returned. I can’t say for sure it’s the NY but surely is suspect for me. There is some serious confusion in this article, free glutamic acid is not the same as MSG, which is the salt of glutamate – meaning that each glutamate molecule has one sodium atom attached.